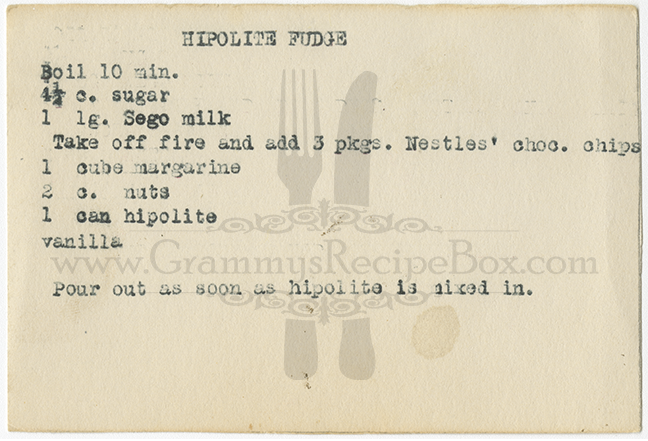 This typewritten recipe requires a bit of "translation" because of brand name products used in it that no longer exist—Hip-O-Lite (misspelled on the recipe card) and Sego Milk. 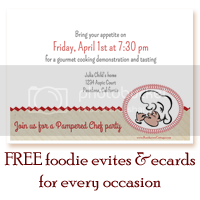 For those interested in how I arrived at the ingredient substitutes, you can go to the bottom of this post for more info. Hip-O-Lite was a brand of marshmallow creme. Although the recipe above calls for "1 can hipolite", in my research I could only find references of Hip-O-Lite marshmallow creme in jars. After some hunting around, I found someone on Pinterest that had posted a photo of a vintage jar label that shows the actual amount of product in one jar was 13 ounces. Sego Milk was produced at the Sego Milk Plant (also known as the Utah Condensed Milk Company Plant) located in the town of Galt in Northern California (a couple hours drive south of my Grammy's home). Based on the alternate name of the plant, I thought that Sego was a brand of sweetened condensed milk. 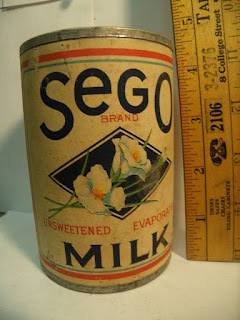 But after doing further sleuthing, I found a photo on Pinterest of an original Sego Milk tin from the 1920s that clearly shows Sego Milk was unsweetened evaporated milk. Cream is rich in only one food element of milk—butterfat. Sego Milk is extra rich in all the food elements of milk—in butterfat and in the bone and tissue building substances that cream does not contain. That is what we mean by "whole-milk" richness. It is the quality that makes milk nature's perfect food. 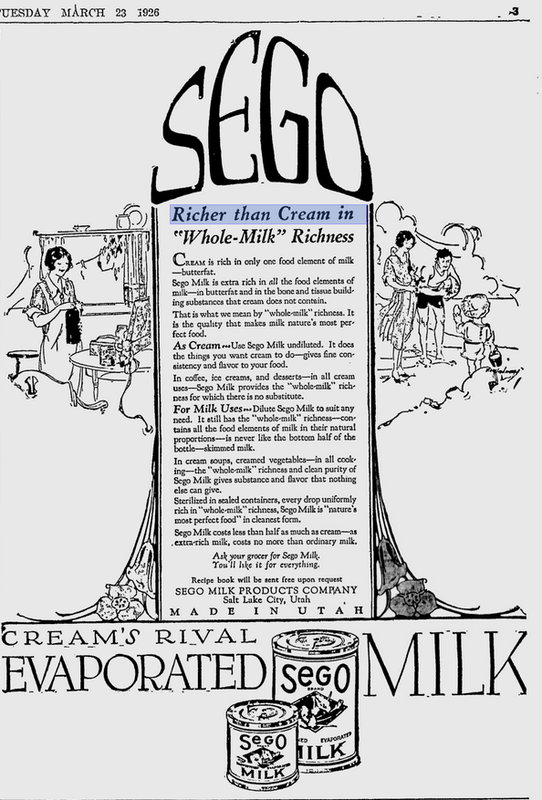 As Cream—Use Sego Milk undiluted. It does the things you want cream to do—gives fine consistency and flavor to your good. In coffee, ice creams, and desserts—in all cream uses—Sego Milk provides the "whole-milk" richness for which there is no substitute. 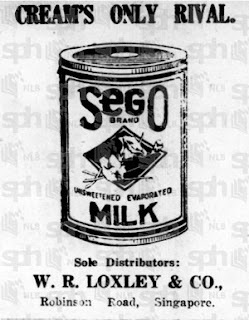 For Milk Uses—Dilute Sego Milk to suit any need. It still has the "whole-milk" richness—contains all the food elements of milk in their natural proportions—is never like the bottom half of the bottle—skimmed milk. In cream soups, creamed vegetables—in all cooking—the "whole-milk" richness and clean purity of Sego Milk gives substance and flavor that nothing else can give. Sterilized in sealed containers, every drop uniformly rich in "whole-milk" richness, Sego Milk is "nature's most perfect food" in cleanest form. Sego Milk costs less than half as much as cream—as extra-rich milk, costs no more than ordinary milk.